Well, let me ask you my friend. Maybe you’re right. Maybe you’re not the best-looking guy. Maybe you’re not the most handsome man under the sun. In fact, maybe you’ve got an ugly mug that only a mother could love. Maybe it seems like girls are never that interested in you. Maybe when you talk to a girl, she loses interest really fast while the handsome pretty boy on the other side of the room seems to get all the attention from the girls. But what if you want to be able to hypnotize even the prettiest girls into thinking you’re the best-looking man on the planet? Yes, oh, yes! It can be done. 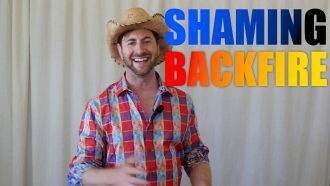 And in this video, I’m going to give you my #1 tip for doing so. So, a little background first, before we dive right into the tip. What all these thoughts have in common is that they’re excuses, excuses based on your LOOKS, in order to NOT take action. With each excuse, what you’re doing is focusing on what you can’t control. And then you never improve because you just sit at home in a comfortable chair and do nothing. Focusing on what you can’t control based on your looks is really an excuse to play videogames or surf the Internet and feel justified about not taking action. If you believe you’re not good-looking enough, you’re not even going to really try. You’re going to stay at home. And then you won’t get any girls. 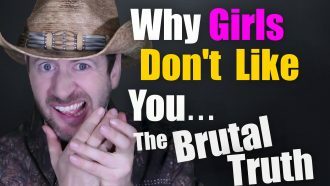 And because you’re not getting any girls, because you’re not really trying that looks like real evidence to your brain, that you don’t have girls because of your looks. Further justification to just stay home and not even try. And a terrible cycle is born, my friend. Think of it as if you’re an entrepreneur of a business. And unfortunately, your business is doing really badly. So, you start blaming your parents for not giving you a good upbringing. You start blaming your school. You start blaming your education. You start blaming lack of luck. All things you can’t control, they already happened. It’s in the past. Meanwhile, you could be improving your marketing. You could be improving your sales. You could improve your employee’s skills. You don’t focus on what you CAN control because you’re so busy blaming your parents always, blaming your problems on things you CAN’T control. If you see that one guy has more genetic potential than you, what are you going to do? Are you going to go into the corner and cry about it? You see another guy who is younger than you, what are you going to do? Are you going to cry about that too? Cry about something that you can’t control? Are you not even going to work out, thinking that you might as well not even try? So here is your tip of the day. Instead of focusing on what you can’t control in terms of your looks, which will demoralize you and cause you to give up, focus on what you CAN control. Go to the gym and start lifting heavy weights, so you have a little bit of muscle mass and you look like you take care of yourself and that you respect your body. Start eating cleaner foods, so you have a healthier glow, so that you feel better. That means getting rid of all the sugary sodas, and pizza, and hamburgers, and French fries, and start eating lean meats and eat a big salad every day. You can’t always improve everything about your looks, but you can start dressing better. You can dress in a way that makes you stand out, dress in a way that catches the eye. You can’t always correct physical flaws, but you can dress in a way that minimizes them. Like if you have skinny legs, you can dress in jeans that makes your legs look fuller. You can work on your posture, so it doesn’t look like you work in front of a desk all day, but that you walk like a prince, you walk like a king, like a BOSS. You can start whitening your teeth. You can get your hair styled or colored. You can work on your voice and how you speak. All these things, and a lot more, you CAN control to improve your looks. It comes down to this: don’t let the excuses control you. Dwelling on excuses will ruin you and hold you back from your dreams. Instead, whatever flaws you perceive yourself to have, first embrace them. The reality is, they’re not as big of a deal as you think, and you can still take action and get results with pretty girls, by just not worrying about it and coming across as confident to the girl. And at the same time, do what you can control, do what you can within your control, to hide or correct the flaw. In my own case, I have a very soft jawline that makes my face look fat. So, instead of crying about the situation and giving up, I just did some research, and I figured out that a little bit of stubble gave my jawline definition and makes it look angular. I’m starting to lose my hair gradually. Instead of crying about it and using it as an excuse to sit at home, I simply started to grow my hair longer on top, and made the strategic use of hats, which I love hats. In fact, because of me losing my hair that got me into using hats and now I get more attention from girls than ever. So, it was a blessing in disguise because I grabbed hold of what I could control and ran with it. Back in the day, my voice completely sucked. I could barely hold a conversation. People couldn’t even hear me because I talked so softly. So, instead of crying about it, and giving up, I simply started doing a lot of vocal exercises. I started socializing with more people, despite it feeling uncomfortable. You do a little fine-tuning here, a little fine-tuning there. Use your flaws as a guide to do a 1% improvement here, a 1% improvement there. And now, I get more attention than I did 20 years ago when I was so much younger. So, if you’re an ugly guy, or not the best-looking guy, don’t dwell on your flaws and give up. There’s so much you can do right now to transform yourself. A couple videos I want to recommend to you. I made a video on shirts and what stylish shirts to wear. Link in the description below. 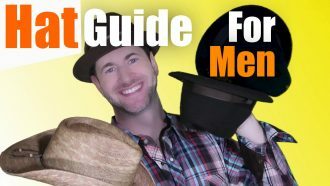 Also, check out my video on hats that catch the eye of girls. Link also in the description below. And of course, check out the Girlfriend Express video, which provides a complete A-to-Z solution for getting an amazing girlfriend, for getting a loyal, loving girlfriend that will make all your buddies drool in jealousy and envy even if you’re not the best-looking guy, even if frankly you’re a downright ugly guy.